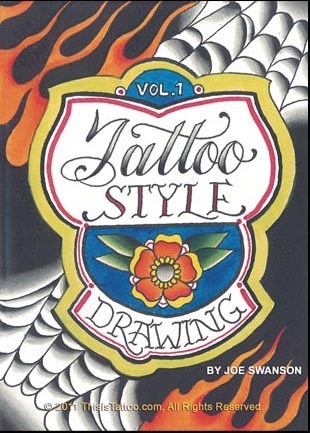 New DVD added - Joe Swanson's: "Tattoo Style Drawing, Vol. 1"
Joe Swanson has made notable contributions to the world of tattoo education with both his podcast and his tutorial DVDs. His latest course, Tattoo Style Drawing, builds on some of the core artist fundamentals that can enhance a tattooist's toolkit. Tattoo Style Drawing - Volume 1 will walk the viewer through 6 chapters of design specific drawing instruction. These age old drawing formulas and tricks have been used throughout history and are currently being used daily by some of todays top tattooers. These tattoo style drawing tutorials will not only ease the drawing process for the viewer, but highly increase their artistic skills. Included in TSD1 are effective instructions on drawing Flowers, Skulls, Spider Webs, Flames, Roses and Layering designs from Sketch to Final. TSD1 will help artists at all levels. The fringe artist interested in tattoo style designs, the artist looking to begin a tattoo career, and up to the veteran artist looking for some new tricks to make their work more efficient will all benefit from watching TSD1. If you are interested in Joe's other title, we still have a few copies of his DVD - "Paint Tattoo Flash" available!